A great way to garner design ideas for your own outdoor project is to visit a garden show. 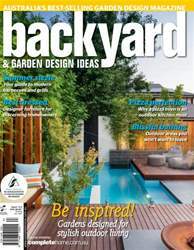 The 2014 Australian Garden Show Sydney provided a wellspring of design inspiration with display gardens from some of this country’s most innovative garden designers. While gardens incorporating outdoor living and relaxation areas were a main theme, many of the show gardens also demonstrated how a garden of any size or style can be a lush and leafy space. And if you’re looking for ideas to enhance your outdoor cooking and entertaining experience, we have that covered, too. In this edition of Backyard & Garden Design Ideas we take a peek at the latest offerings in barbecues, pizza ovens and outdoor kitchens and find there is something to suit every budget, and every garden, regardless of style or size.